I think Jesus would be stoked that we celebrate his resurrection with candy, don’t you? 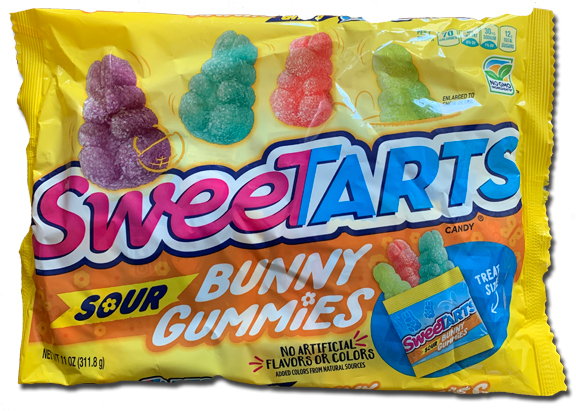 And SweeTarts can be proud of the offering they are providing Easter abiders with their Sour Gummy Bunnies. Easter candy is tried and true – chocolate meets Cadbury egg meets robin eggs with a side of jelly beans. 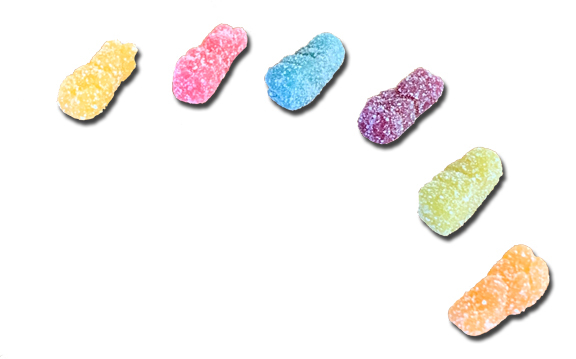 Sour gummies are now in the fold because when are they NOT in the fold? They aren’t not. Sour gummies were 74% of the reason Jonny and I started this site. I’ve always liked Sweetarts — I consider them an OG sour. So I’m not surprised their Bunny-meets-gummy Easter treat is on point. These gummies are the right size in their little package (the big package you see above comes with a slew of mini packs, perfect for the basket) — just a smidge smaller than the Sour Patch Kid. Not too far off on SPK consistency either, although the Sweetarts bunnies are a tad more firm. Which I like. The sour is on point, the sweetness not too much, and if you pay attention, the flavors are good. According to the package, they’re not artificial, and neither are the colors. You can see from my gorgeous pic above, the colors are delightfully Easter and you can guess the flavors; they are what they look like. Great review. An ex introduced me to the Haribou Twin snakes (best thing out of that relationship) in 2016 and I’ve been more into gummies since then. I have the Haribou sour cubes in my possession. I might have to check these out as well. By the way…. the Reese’s Egg with reeses pieces inside (individually packaged large size) is just PHENOMENAL. They are better than the regular Reeses Eggs which are already superb. Just superb- adding crunch into the mix. Haribo Twin Snakes are the best of the new haribo bunch IMHO. Some of the other I think have lost that deep but subtle fruity flavor Haribo is/was so good at.